Without their locks the two Wey Navigations would not function. The seventeen locks between Godalming and Weybridge allow the level of water along the canal to be managed providing enough depth for vessels to navigate whilst also allowing controlled passage between the sections of waterway. Volunteers have laboured since 1970 to re-open the Wey & Arun Junction Canal that once linked the Wey Navigation with the Arun River and the south coast. Sadly it is unlikely that the full 23 mile (37 km) length will ever be restored. Much of the old course had been sold and has been built over. To date 6 locks, 12 bridges and a viaduct have been restored. The New Haw lock keeper’s cottage was said by Tiny Harris, who was lock keeper there from 1959 until 1982, to be haunted. The ghost was a previous keeper’s wife who had drowned in the water cut behind the lock. She appeared in a long shapeless stinking mist that passed through the kitchen at the back of the cottage. Such was the cold and stench of the mist when it appeared that Harris’ wife fainted and collapsed when she witnessed it. Whether it was the stench or the ghost was never determined. 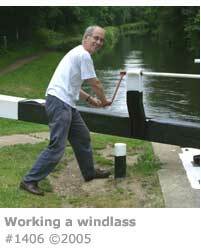 “The big red one [windlass] is what they lend you to use on the river Wey. Its nearly twice as long as mine. You get plenty of leverage but your arms have to describe a huge circle when you turn it, and often you are leaning out over the water at the time so it makes it feel very precarious, especially when the little plank you are standing on is wobbling beneath your feet. And why do they paint the windlasses dull red? It makes it quite hard to see them when you lay them on the grass to have hands free to catch a rope. I like my bright yellow one, but as you can see it needs a lick of paint now. There are 13 locks on the Wey Navigation and 4 on the Godalming Navigation. A lock has a simple function, that being to provide a control to maintain or change the level of water within a stretch of a navigation. A typical lock has a chamber dug into the channel and is lined with brick, although the early locks along the Wey were turf lined. Gates with a system of gearing to allow a paddle to be raised and lowered to allow or restrict the flow of water are hinged to enable them to be opened and closed by pushing on a heavy balance beam which protrudes horizontally from the gate to provide sufficient leverage, particularly useful given the heavy weight of the gates found on the Wey Navigations. There are two common types of locks found on British waterways and these were originally both found on the Wey and Godalming Navigations. Today modernisation has left only the easier to operate pound locks, and even these have been dramatically improved in their construction and operation to facilitate their use by the large numbers of relatively inexperienced pleasure boaters that help keep the waterway a viable proposition. 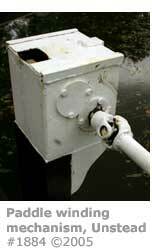 A Pound Lock is effectively the placing of two Flash Locks (see below) close together to provide a simple method of raising or lowering the level of water to enable craft to effectively navigate upstream or downstream. The lock also provides a guarantee that the water level between the individual locks will be maintained to a degree that vessels won’t run aground. The chamber dug into the bed of the river is large enough to accommodate the type of craft typically plying the navigation. At each end gates robust enough to withhold the pressure of water are hung from substantial <> and contain within them paddles that can be raised and lowered to control the flow of water. 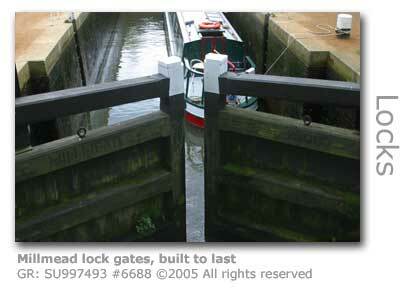 Some pound locks have a single gate upstream as this gate is a lot shorter and hence lighter than the bottom gates. However those on the Wey are double gates as the lock chambers are relatively wide and would result in an overly heavy single gate. Pound locks were invented in Holland, although there were primitive examples in Italy by 1440. Archaeologists have postulated that remains of river structures in Egypt are pound locks dating back to the reign of Pharoah Seneferu, the great pyramid builder, app. 2600 BC. 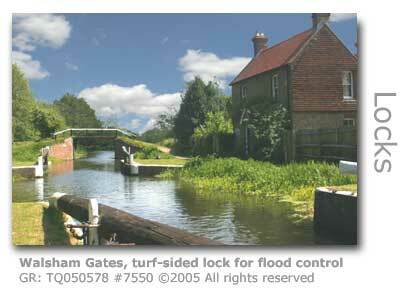 A Flash Lock is effectively a weir with a single gate to allow boats to navigate beyond the structure. Originally very simple structures allowing boards to be dropped into place across the water to build up depth later versions used movable gates. 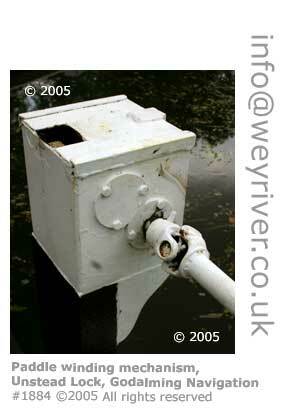 Flash locks did exist on the Wey in the early days but were replaced with pound locks as soon as it became practical to do so. 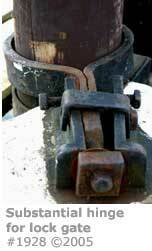 Flash locks are extremely difficult to navigate and inherently dangerous, often resulting in damage to vessels and injury to their crews. When closed the gates allowed the stretch of river behind them to fill with water. As there was only a single gate without any method of containing the water, once the gate was opened the water would rush out down to the lower level of the river on the other side gradually depleting the water level upstream. Boats would literally have to ride the rush of water to move to the next level, an extremely difficult manoeuvre if you’re having to haul a barge upstream against the flow of water with only horse or human power to do so, although winches were later installed to aid the process. Flash locks were also called Navigation Weirs and Staunches. The stretch of canal lying between two locks is called the Pound, with the length of the Pound depending upon how rapidly the terrain was falling away. In some canals the Pound may only be a few feet, and in others many miles. The Staffordshire and Worcestershire Canal for example has to navigate steep terrain and features locks that act like a staircase with a series of interlinked gates and chambers in the case of Botterham, or individual locks a few feet apart at Bratch. The fall of the Wey is gentle, dropping only 98 feet (30 m) over the full 87 miles (140 km) of the river, with the Navigations only contending with the last 20 miles (32 kim). This amount of fall only requires a lock every few miles. 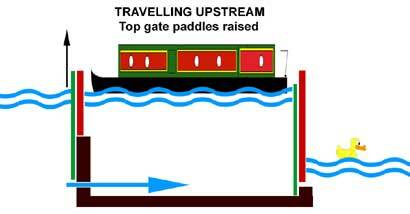 Working a vessel through a lock is termed 'to lock'. A Lock Wheeler was a member of the barge crew who traveled ahead, often by bicycle, to prepare the locks. 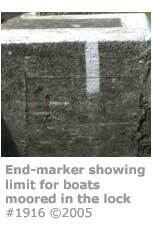 On navigable waterways large posts, Lock Distance Posts, are set into the riverbank fifteen or twenty yards (14 – 18 m) from the head and tail of a lock. The first boat to pass the post has claim to the lock. 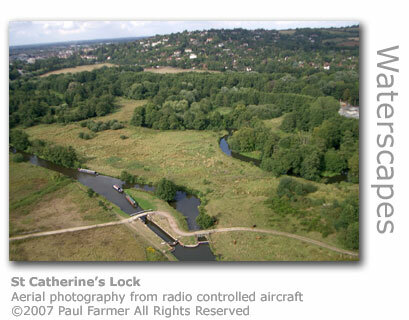 Most of the locks on the Wey Navigation were originally turf-sided. The chamber was excavated to ensure that it was wide enough to accommodate a barge, which was considerably wider than the narrowboats that you now commonly see along the waterway today. At either end of the chamber substantial walls of timber were built in order to support the massive and heavy lock gates, which had to be strong enough to bear considerable water pressure. The rest of the lock sides between the gates and these retaining walls did not have to be particularly robust and were left as sloping bare earth over which turf was allowed to grow. Provided they didn’t leak water these earth banks worked perfectly well, although on the Wey half-height timber walls were built from end to end in order to keep the heavy barges in line with the gates. Alders are very common trees along the river and once felled and sawn make for a very hard wood that resists movement after repeated wetting and drying. 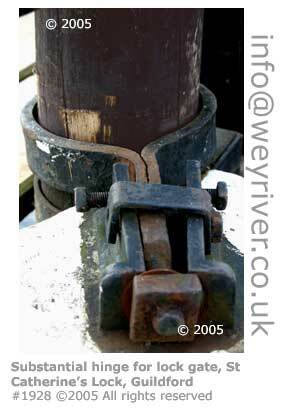 Alder was therefore a perfect wood for constructing lock gates. In the 20th century all of the Wey locks were renovated and rebuilt at one time or another in concrete or brick and providing the lock chambers with vertical walls throughout their full length. This, and the adopting of modern winding mechanisms and lock paddles that were easier to operate, were brought in both to assist the inexperienced pleasure boaters of today and to meet stringent safety regulations. Walsham Gates (GR: TQ050578) on the Wey Navigation near Ripley in Surrey is a flood lock that still has turf-sides and the original system of pegged boards to raise and lower the paddles in the gates. The principles of pound lock operation are simple. 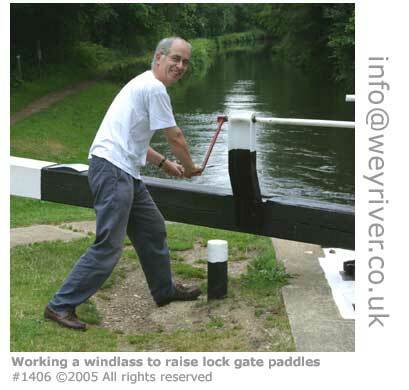 The paddles are raised and lowered using a windlass, similar in appearance to a car’s wheelbrace, that is attached to the paddle’s square tapering bar and turned in the appropriate direction. The term ‘windlass’ comes from Middle English ‘wyndlas’ with origins in Old Norse ‘vindass’ meaning ‘winding pole’. This method is a relatively modern adaptation as the original locks required that boards be manually levered up whilst straddling precariously on the beam of the gates above the water and wielding a 3 ft (1 m) crowbar.